The challenging economic environment in the aftermath of the Great Recession has turned up the pressure for brands to create advertising that will justify the investment… and the continued advertising budget. To meet this challenge, one advertising format brands are turning to is the product benefits ad. We formally define this type of advertising as “brand promotion aimed at showing how a product can satisfy the articulated and tacit needs and wants of the target consumer.” This format is related to the much-maligned “hard sell” format in that it doesn’t hide the fact that it is intended to sell the product. Since selling the product is typically the ultimate goal of advertising, this format remains a significant presence on-air, if not on the rosters of advertising award winners. For brands interested in deploying such an approach, the question becomes, are there proven techniques for creating product benefits ads that sell? This is the first in a four-part series that will not only answer this question with a resounding “yes!” but also endeavor to provide practical and empirically based guidelines for achieving this goal – product benefits ads that sell. The first key essence of product benefits advertising is “the product as the main character of the story”. This may seem obvious at first, but the desire for creativity may tug in a different direction. But the importance of the presence of the product and brand name consistently throughout the advertising cannot be overstated. This ensures the effective linkage of the communicated benefits with the advertised product and maximizes the opportunity to associate evoked emotions from the ad with the brand. Empirically, we have seen that the use of the following tactics related to brand presence has increased the likelihood of achieving advertising that sells. – Note that this tactic implies an avoidance of blind lead-ins in product benefits advertising. Combinations of different types of product presence can keep the focus on the product/brand while allowing visual variety and the product story to unfold. This example ad for Activa Yogurt achieved CCPersuasion level of more than double the norm. Careful placement of verbal and visual mentions should be made within the context of the ad. Voiced over brand name mentions should not occur during visual communication of product information/benefits (such as a demonstration). Instead, use natural pauses and transitions to voice over the brand name so it doesn’t compete for attention with critical benefit communication. Visual brand name mentions should be large enough to consciously register with viewers, but should not interfere with other on-screen visuals. Product shots of brand extensions and product variants not sharing all the benefits being communicated for the advertised product should not be included in the body of the ad. 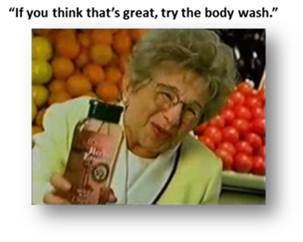 An example is body wash images added within a shampoo benefits ad. This tactic actually confuses the communication and lessens effectiveness. Can “product as main character” survive the presence of a top celebrity, or will it inevitably be elbowed out? 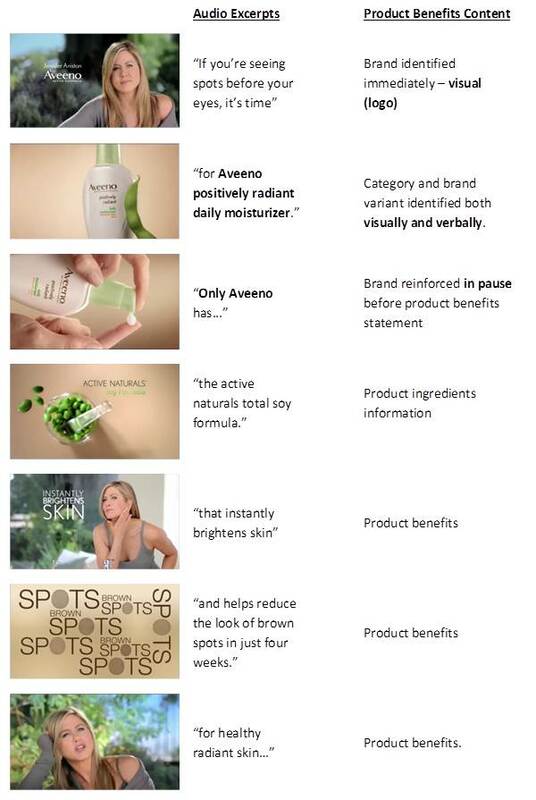 This excellent ad from Aveeno, which employs many of the described tactics, shows that this is indeed possible. Woody Allen is often quoted as saying “90-percent of success is just showing up.” So now that we have ensured that the product shows up for our ad, we are well on our way to success. Of course, the last 10-percent is always the hardest part. In the next three parts of our series on product benefits ads, we’ll examine some techniques for making our “main character” so compelling that viewers will be ready to seek it out.